Golfer Tiger Woods has pleased guilty to reckless driving in a Florida court. But the former world number one has avoided a drink driving conviction after his arrest on May 29 - and will instead enter a 'diversion programme'. Woods was said to have had five different drugs in his system at the time of his driving while under the influence arrest - including the main chemical compound in cannabis. 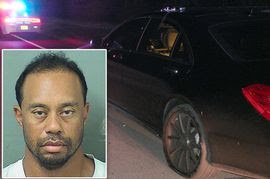 The Palm Beach County Sheriff's Office released the toxicology report from his arrest in which the golfer was found slumped asleep in his car with the engine running. Woods was incoherent, but no alcohol was found in his system. The report shows Woods tested positive for painkillers Hydrocodone and Hydromorphone, anxiety disorder drug Alprazolam, the sleeping pill Zolpidem and THC. THC, or tetrahydrocannabinol, is the chemical compound in cannabis responsible for a euphoric high. Woods said his arrest came due to an unexpected reaction to prescription medication "I didn't realise the mix of medications affected me so strongly,” he said at the time. Woods, who said after his arrest he would get treatment, then struck a plea deal with prosecutors.